Cyrtanthus leucanthus, stimulated to flower by fire, is a threatened species of the largest African genus in the Amaryllidaceae family. Perennial with an obovate bulb. Leaves solitary, grass-like tapering to a pointed apex with more or less straight sides and shorter than the peduncle (stalk of inflorescence), usually dry at flowering. Peduncle "the thickness of a goose's quill", covered with a waxy coating, 150-250 mm tall. Pedicels (stalks of flowers) erect, 1 mm thick. Flowers 1 or 2 on a peduncle, white and sweetly scented, tubular with 6 broad, spreading tepals. Stamens arranged in two series of 3 each, reaching the mouth of the perianth tube. Style somewhat shorter than the perianth, slightly curved, stigma 3-branched. In nature Cyrtanthus leucanthus is usually associated with Haemanthus canaliculatus and in both species flowering is stimulated by fire. In all other respects C. leucanthus is quite different from H. canaliculatus, the latter having a red, brush-like cluster of small, somewhat tubular flowers. 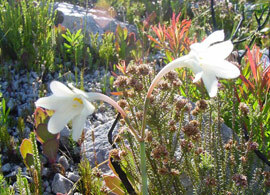 Cyrtanthus leucanthus is a range-restricted habitat specialist listed as Endangered in the Red List of South African Plants, and, due to threats by aliens and coastal developments, the decline of its remaining subpopulations is continuous. Cyrtanthus leucanthus is known from near Betty's Bay eastward to the Potberg, Western Cape, where it grows on sandstone or shale ridges. The genus name Cyrtanthus is derived from the Greek words kyrtos and anthos meaning curved flower, and the specific name, leucanthus, means white flower. Cyrtanthus is mainly a southern African genus which ranges into Tropical Africa. As many as 55 species occur in southern Africa. The southern part of the Eastern Cape Province may be looked upon as the headquarters of the genus with smaller centres in the southern Western Cape, Mpumalanga and KwaZulu-Natal. Throughout its distribution Cyrtanthus has species adapted to cope with fire, and because of this specialization they are commonly known as fire lilies. Cyrtanthus leucanthus occurs on coastal lowlands. Most species in the genus are known to be fire-dependant. 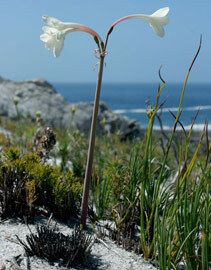 Cyrtanthus leucanthus is one of a particular group of species that inhabits fynbos, a fire-prone ecosystem to which it is well adapted. Due to its tubular floral form and scent Cyrtanthus leucanthus is inferred to be pollinated by nocturnal moths as these have long mouth parts that can probe its simple, long flower tube. Due to the floral variation and beauty of the entire genus, Cyrtanthus species generally make excellent pot plants. Although the genus consists of many easily cultivated species, Cyrtanthus leucanthus is amongst those that are considered difficult or impossible to grow, being one of the deciduous species which must be kept absolutely dry once the leaves have fallen. They all require a very well-drained sandy medium containing varying amounts of organic matter, depending on their germination capability. As C. leucanthus is considered to be a difficult species to grow, even more sand and more gravel should be incorporated into its growing medium. Due to fire being a requirement for blooming in the wild, it is a shy or slow bloomer in cultivation and more research is needed to find out whether treating it with smoke will trigger its flowering. As many bulbs of the genus are situated above the ground or the neck of the bulb grows level or just below the ground, the watering procedure is an important consideration. The more difficult deciduous species like C. leucanthus should be allowed to dry out completely between waterings during the growing period and should be kept absolutely dry when the plant has naturally stopped growing and the leaves have fallen off. Du Plessis, N.M. & Duncan, G.D. 1989. Bulbous plants of southern Africa: A guide to their cultivation and propagation. Tafelberg, Cape Town. Goldblatt, P. & Manning, J.C. 2000. Cape Plants: A conspectus of the Cape Flora of South Africa. Strelitzia 9. National Botanical Institute, Cape Town. Manning, J.C., Goldblatt, P. & Snijman, D. 2002. 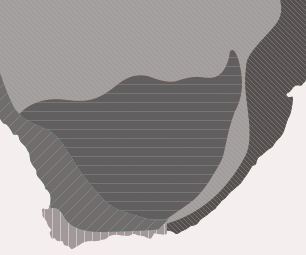 The color encyclopedia of Cape bulbs. Timber Press, Oregon. Raimondo, D., Von Staden, L., Foden, W., Victor, J.E., Helme, N.A., Turner, R.C., Kamundi, D.A. & Manyama, P.A (eds) 2009. Red List of South African plants 2009. Strelitzia 25. South African National Biodiversity Institute, Pretoria.Reid, C. & Dyer, R.A. 1984. A review of the southern African species of Cyrtanthus. The American Plant Life Society, La Jolla, California. Snijman, D.A. 1994. Two rare Cape Amaryllideae species. Veld & Flora 80(4): 117. Snijman, D.A. & Meerow, A.W. 2010. Floral and macroecological evolution within Cyrtanthus (Amaryllidaceae): Inferences from combined analyses of plastid ndhF and nrDNA ITS sequences. South African Journal of Botany 76: 217-238.